Navin M. Valrani loves watching and playing cricket. Given his Indian origin, that shouldn’t be a surprise. Valrani became a resident of Dubai when he was only three months old, grew up there and now works for the Al Shirawi Group. Valrani is part of the second generation of the conglomerate’s founding families to have a managerial role in the business. As CEO of the Engineering Services Cluster, he manages a web of some 10 companies with a combined turnover of $200 million and 3,500 employees. The Al Shirawi Group has a passion for business, a zeal for fast growth and a focus on quick decision making. It started in 1971 as a trading and contracting company and has now diversified to include a whole cross-section of products, services and industries, from steel and metal fabrication, to engineering and food products. The Group has diverse and global relationships, which include British Steel Corporation, Tata Iron and Steel Company, Sumitomo Corporation, Nippon Steel, Inchon, Klockner & Co, (Germany) and Highveld Steel & Vanadium Corp, (South Africa). Valrani spoke to Knowledge@Wharton Arabic on a range of issues. Knowledge@Wharton: How did you learn to play cricket considering that you had limited exposure to it both in Dubai and the United States? Navin Valrani: Give any Indian a bat, ball and a field, and a game is on! Growing up in Dubai, cricket was the only entertainment we really had. Dubai has a large expatriate Indian community, so getting opportunities to play cricket has never been a problem. While I was in college in the U.S., I did take a cricket sabbatical and would keep in touch with the game during vacations. Knowledge@Wharton: What was your schooling like? Valrani: Schooling in Dubai was and is excellent. My nursery, primary school and secondary school are still standing as of today and are landmark institutions in the city. It was my secondary school, Dubai College, which prepared me for the University of Pennsylvania and more specifically for the Wharton School. Some of my fondest memories are those of my years at Penn. The American culture that I experienced was very warm and welcoming. I made some of my best friends at Penn, and Wharton gave me an education that prepared me well for the real world. Knowledge@Wharton: How did this prepare you for your role in the family business? Valrani: My concentration at Wharton was entrepreneurial management. I could not think of a better program to prepare one to join a family business. In my junior year, I recall taking a family business class [where] we had to write out a business plan for one of our family businesses. I wrote a plan for the Al Shirawi Group’s air conditioning business and, ironically, six years later, I was the CEO of that company. Knowledge@Wharton: The Al Shirawi Group is one of the largest in the Middle East. Could you tell us something about its origins and its current businesses? Valrani: We are a well-managed, efficiently-run family conglomerate. Our chairman, Abdulla Al Shirawi, and our present senior vice-chairman, Mohan Valrani, founded the business in 1971. Dubai was a small city in those days but the two of them were extremely ambitious. Their desire to grow is really what laid the foundations of the Al Shirawi Group. That ambition and drive is with them even today. Knowledge@Wharton: What exactly are you responsible for? Knowledge@Wharton: Your group has relationships with more than 100 multinationals. What sorts of arrangements are these and are they significant contributors to your business? Valrani: These arrangements vary from joint ventures to licensing and distribution agreements. The reputation of our group is second to none and this, along with our core values, makes us an ideal fit for several large multinationals across the globe that share a similar philosophy to ours. Knowledge@Wharton: The management of the group has passed on to the second generation. You are part of that. What is the current management structure like? Who handles what? Valrani: There are eight of us in the second generation, and each one of us is handling a cluster of companies in the group. In effect, each one of us is the CEO of our respective cluster. The clusters range from industries, such as printing, to distribution businesses, such as electronics. In addition, there are five of us who have additional responsibilities at the board level. Our model is quite unique and is really the recipe for our success. Knowledge@Wharton: How exactly are strategic and operational decisions made? Does the structure hamper your expansion plans? Valrani: Strategic and operations decisions are taken by the CEO in consultation with the management team for a given cluster. This structure actually helps both geographical and sectoral expansion plans, as each CEO is also a shareholder and a family member. Decisions are made at lightning speed. Knowledge@Wharton: What new geographic areas are you looking at now? Do you see yourself as a multinational or as fast becoming one? Valrani: We are looking very seriously at Abu Dhabi, Oman and Qatar. These are markets with strong fundamentals and significant government spending. We see ourselves as continuing to be a strong, well-managed family business that will always be focused on the Middle East. Knowledge@Wharton: How has the [debt] crisis in Dubai affected you? How soon do you see it ending? Valrani: The crisis has affected us just like it has affected most in the area. However, we see ourselves coming out stronger as a result of the crisis. Our shareholders are more focused than ever and, relative to our peers, our balance sheets are rock solid. As far as the end of the crisis is concerned, we truly believe we have hit rock bottom and the only way from here is up. Dubai as a city has created an unprecedented service model. That model is not only difficult to replicate, but is also here to stay. Knowledge@Wharton: You have been talking about Dubai as principally a service provider. Could you elaborate on that and how you see Dubai evolving? Valrani: Dubai has a very unique position and is a regional hub for financial, retail, education and health care services. The momentum behind the initiatives launched by the government in these areas is tremendous and I see Dubai continuing to excel. The region that Dubai caters to is vast, covering the area from the Indian subcontinent through Eastern Europe, the Middle East and North Africa. I see Dubai further consolidating its position as the regional hub of choice for multinationals. The quality of life offered in Dubai is second to none and hence it will always be the city of choice for any [expatriate] wanting to locate in the Middle East. Knowledge@Wharton: Where do you see your group a decade down the line? 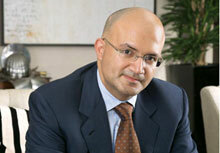 Valrani: I see us further consolidating our market positions in our areas of expertise. We plan to strengthen our position in the eight core industries that we work in with a significant geographical presence in the United Arab Emirates, Qatar and Oman. Predicting turnover a decade down the line is never easy but if the last decade is anything to go by, I will be surprised if we are not 10 times our present size 10 years from now.